Prunes in Crispy Bacon - A recipe from Savor California, the online showcase for extraordinary gourmet foods and beverages from California. 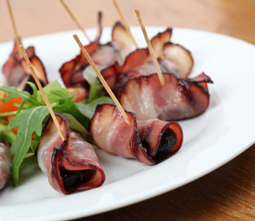 These yummy hors d'oeuvres are also called "Devil on Horseback." Preheat the oven to 200°C . Brush a baking tray with the oil. Cut each bacon rasher in half lengthways. Lay a strip of bacon on a chopping board, place a dried prune at the top edge and roll, wrapping it tightly around the prune. Pierce a cocktail stick through the centre of the wrapped prune to secure. Repeat with the remaining bacon and prunes. Place the prunes on a the prepared baking tray and bake them for 10–15 minutes, turning over half way through cooking, until the bacon is slightly crispy on both sides.